Is there a minimum length of pipe required after the Flow Meter? “ I know that at least 6” of 1” Pipe is required on the inlet side of the flow meter to prevent turbulence which will cause inaccurate readings. Here is the response I received. “ Thank you for contacting Rachio Customer Support. My name is Matthew and I would be happy to assist you. We recommend 16" total of copper piping (14" minimum for PVC) when installing the flow meter, which allows for a similar amount of a buffer on both ends of the flow meter. Please don’t hesitate to reach out if you have other questions, comments, or concerns as well. I’ve not received a reply. To have the same amount of buffer ( ie 6” ) on both sides of the flow meter you’d need an 18-1/2” Long section of pipe rather an the described 14” Long section of pipe. Seems like you already know the answer as you are quoting the instructions (there are numerous posts with pictures installed this way), yet you are you looking for a human to confirm for some reason? The instructions don’t specify a minimum length for the downstream piece of pipe before an elbow, only the 6” length of pipe upstream of the flow meter. I can calculate that they are using a 1-1/2” length of pipe downstream of the flow meter using the 14” length of straight pipe they list in their instructions for installing on 1” PVC pipe. However, this does not answer my question. Is the 1-1/2” length of pipe specified because a shorter length would cause error producing turbulence or because that’s the minimum amount of pipe necessary to install the Orbit PVC Push Lock fitting they recommend ?. I would like to use a SharkBite 1” PVC to MPT adapter and screw the MPT side into a 1” PVC Slip to MPT elbow. Since the flow meter outflow side will connect directly to the SharkBite fitting there will be less distance from the elbow to the flow meter than the 1-1/2” of PVC pipe that results from using their instructions. Originally they recommended an 18” length of straight pipe and SharkBite slip fittings for installation without specifying the 6” length of pipe on the inflow side. It’s obvious that they are continually testing & refining the instructions. 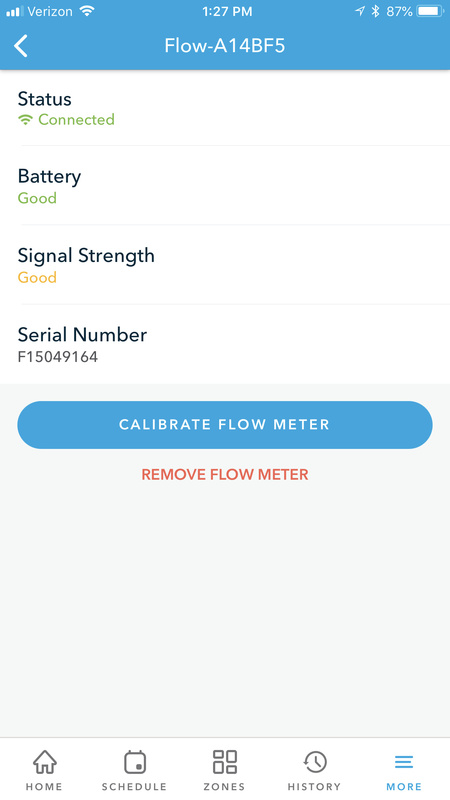 I did see another post where Gene ( not sure if he’s a member or a Rachio Support Tech ) describes the fact that the flow meter uses turbulence to determine the flow rate and an upstream elbow too close to the flow meter can cause erroneous readings. He goes on to say he believes that bends downline “should not greatly affect accuracy “. I’d like some confirmation from Rachio Support that this is in fact true before deciding how I’m going to install my flow meter due to limited access. @BigAlT - I think the Rachio measurements are the overall length of the install. All the documentation that I’ve seen from Rachio is dealing with the upstream measurement. @Gene is a member (just like I am), but he’s an engineer and has a product in the water monitoring/saving segment. IMHO, he’s pretty spot on with his advice as I think he has done some peeking under the hood on the circuit boards on the Rachio controllers. I understand the question as Toro flow meters want 10x upstream and 5X downstream of the pipe diameter without obstructions for their flow meters to report accurately. Before Rachio came out with their installation instructions and video I had similar questions when designing and order the retrofit components. Started looking at other “wired” flow meter installation instructions. There were differences but generally their recommendations were similar within a range of 10-15" before the flow meter and 6" after the flow meter. Another example was 10 pipe diameters of straight pipe upstream and 5 diameters of pipe downstream. Obviously, those are significantly longer than the Rachio recommendations when they came out. It could be the Rachio flow meter operates better in turbulent conditions or the accuracy required for irrigation measurement is less sensitive than other flow meter applications. In my case, had to redesign my backflow piping in either case so took the opportunity to extend the pipes to accommodate longer straight runs on either side of the flow meter, assuming additional straight length could only help with flow meter accuracy. My problem is that I have an underground installation. I don’t want to use the Rachio 1” PVC Underground instructions as the meter is located on the bottom of the valve box resulting in a great deal of dirt between the flow meter and the controller resulting in a great deal of signal loss. I want to mount mine on risers so it will sit just below the valve box cover. I have a Jumbo Sized Valve Box but it only has 20” of space under the cover to accommodate 2 elbows, the 6” of pipe required before the inflow side of the flow meter, the 2 orbit or Sharkbite push on fittings and the piece of pipe connecting the outflow push on fitting to the elbow. It will work using the 14” length of pipe recommended for the 1” PVC above ground installation as the elbows each are 2” long so would give me an 18” installation length. My problem with the Orbit fittings is that they are not removable from the flow meter ( if they should leak ) except by cutting them off which exposes the flow meter coupling area to damage which might render it unusable. The sharkbites May be removable from the flow meter if you install a thin stainless washer before installing the sharkbite on the flow meter. I’m still trying to source a thin enough stainless washer of sufficient ID to fit over the flow meter but thin enough to allow the sharkbite to fully mate with the flow meter. I’m surprised that none of the Rachio Support personnel have replied to my request or joined in this conversation. @BigAIT - my flow meter is at the bottom of my valve box, probably 10 - 12" deep. My Rachio controller is real close, probably 15 feet, and reports excellent signal. (YMMV) How far away is the Rachio controller from the flow meter. Mine is about 125ft thru several walls. I have a nearby valve box. Putting the flow meter in the bottom of the box gives me a “poor” signal report. Raising it up by putting it on a cardboard box so it sits just under the closed lid raises the signal level to “ good “. @BigAlT the only other option would be to use the Pringles can, as it sounds like this is right on the ragged edge of the range.